Dog eye problems come in serious and not so serious varieties. Knowing how to identify the difference and when to seek help from your veterinarian can be critical. Conjunctivitis is one of many common canine health problems. It can be explained as painful inflammation or infection of the conjunctiva, the tissues that line the eyelids. Conjunctivitis is not life threatening; however, this does not mean that you should not seek immediate medical help for your pet. If the disease is left untreated, it could damage the eye and the infection could also spread to the other eye. It could also lead to the development of corneal ulcers. Immediate medical attention is important in the case of dog conjunctivitis, because it could indicate a more serious disease: canine distemper. Understanding the symptoms associated with one of the most common dog eye problems is very important for the well being of your dog’s health. There are several causes associated with conjunctivitis or dog pink eye, including dog allergies, bacterial infection, viral infection or the presence of a foreign object in the eye. Your dog may be sensitive to perfume, pollen, food or fiber. Allergens often cause the development of dog pink eye. Like with many other canine eye infections, dog conjunctivitis could also be caused by a bacterial or viral infection. A bacterial infection can be transferred from one dog to another or even from humans to a dog. A viral infection is typically caused by the airborne presence of a virus. Yellow and greenish discharge from the eyes indicates bacterial or viral infection. 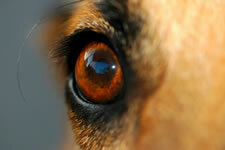 Dog pink eye can also be caused by the presence of some irritant in your dog’s eye. Be sure to check for foreign objects in the eye before jumping to conclusions. A small piece of wood, grass or other irritant could be causing the redness and may need to be removed. When dog eye problems are caused by an allergen and you can identify the source of the allergic reaction, try to remove that object, food or condition from the dog’s environment. If you cannot identify the culprit and your dog’s condition is serious or not improving, you may need to visit your veterinarian and have them prescribe a medication like hydrocortisone. In the case of a bacterial or viral infection, your veterinarian will likely prescribe eye drops or a bacterial and fungicidal ointment to take care of the problem. In serious cases, antibiotics may also be prescribed. If you discover a foreign object in your dog’s eye, it should be carefully removed. As a first step, you may be able to remove the object by flushing your dog’s eye with lukewarm water. If you are unsuccessful or you do not feel comfortable with this approach, a visit to your veterinarian is recommended. Keeping your dog’s eyes clean is the best way to prevent dog eye problems. If you suspect dog allergies, try to identify and eliminate the allergen from their environment. It is also essential to keep your dog free from ticks and fleas, as they too can cause conjunctivitis or dog pink eye. Keep a close watch on your dog and take immediate action if you suspect they may be suffering from this most common of dog eye problems.